Delivers the goods in terms of sound quality, surround mix and EQ malleability. Can the Ear Force i60 cans overcome the minimalist aesthetic with all-out audio? Barring the poor Apple-imitation design choices, this headset delivers on its price tag in terms of audio quality, portability, and preset options. Recommended. 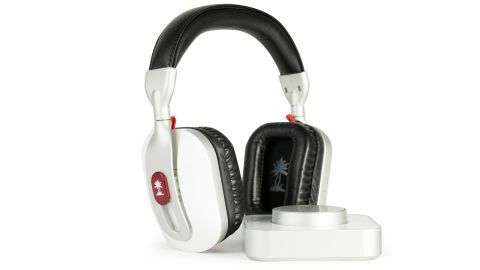 Turtle Beach is best known for its gaming headsets. Its Ear Force range has traditionally catered for that market with some panache, delivering top notch build quality alongside surround sound and useful built-in presets. This i60 wireless media headset is the flagship in a new range that attempts to branch out into broader multimedia use - specifically for Apple owners. Don't be put off if you're a PC or Android device user though: the i60 will still play nice with your system, it'll just take a couple of extra clicks in your initial setup. The i60's aesthetic is very much informed by Apple's minimalist design. Both the wireless headset and the base station that connects to your machine via USB have a glossy white finish with a brushed aluminium trim. It does find itself in an awkward halfway house though, between the elegant simplicity of the Apple products it hopes to sit beside and the rugged functionality of a gaming headset. The cans themselves are bristling with buttons behind each ear cup - eight in total - and the overall design brings gaming to mind before it does audiophile-approved luxury. Thankfully, each button is accompanied by a voiceover that tells you what you just pressed. If it sounds like we're being picky, keep in mind that these are priced at £349.99, and as such find themselves brushing shoulders with the likes of B&O's BeoPlay H6, the P7 from Bowers & Wilkins and the Parrot Zik. Only the latter can provide a straight fight in terms of raw functionality (those eight buttons certainly aren't there for decoration) but attaching such a weighty price tag to your product does invite comparisons to the very best around. In both visual appeal and build quality then, the Ear Force i60 falls short. The foam and leatherette contact points feel a bit too hard, and the shape of each cup produces a slight seashell effect when you don the headset. On top of that, we found one of the earpieces on our review sample made a squeaking noise whenever it was adjusted. Forgivable - at anything less than the £350 mark. The good news is that we just got all the i60's drawbacks out of the way nice and early. Since look and feel are the first things you notice about a product like this, the i60 gives a deceptively lukewarm first impression, but once you churn some sound through those cans, you'll find yourself converted. Setup is very easy for both Apple and Windows machines. They aren't quite plug in and play, but all that's required of you is to head into your audio preferences, mark it as your new default device, and in the case of Windows users, configure its audio output to 7.1 surround. It's hardly back-breaking labour and, boy, you'll be glad you did. The i60 produces one of the best digital surround spaces we've heard in a headset. There's no low-end murkiness, no fidelity penalty for being wireless, just pinpoint precision from each of its six channels. Everything Turtle Beach learned from the gamer market, where it's heavily involved in top-level tournament players, pays off dividends in this regard. Remember all those ugly buttons? Well, two of them on the left cup cycle between a total of eight presets. Each of them is useful, and none are overcooked. Bass, treble and mid boosts are all programmed as a useable EQ setting, not just a quick blast to demonstrate the product's aural range. Gamers will find 'footstep focus' and 'superhuman hearing' presets particularly handy in multiplayer shooters to get the jump on their opponents, while 'stereo expander' is useful when encouraging your mates to have a listen and trying to convince them you didn't just flush away £350. It's incredibly rare to come across a headset capable of satisfying gaming and musical demands at once, and the Ear Force i60 is part of that rare breed. With the EQ set nice and flat and the sound pumped up high, the 50mm drivers betray no audible distortion, and the low, mid and high frequencies are all distinct and vibrant. These are cans you can use on the move, too. In addition to the included airline adapter for use on planes, the i60's Bluetooth functionality lets your pair with iOS and Android devices. Turtle Beach's iOS app is nicely designed, and allows plenty of EQ preset-tweaking if you want to take things further than jabbing at buttons. The i60's onboard mic has its own set of presets too, including reverb and pitch-shifting effects that are also found in its gaming range, but Apple users won't find much use for them. The overall voice quality's solid, but we couldn't find a noise-cancelling setting on our review set, which seems like it would have been better suited to the 'I' range than the ol' squeaky voice. But since we're generally very impressed with the i60, let's finish on a high - these things last forever once you've given the battery a full charge. Turtle Beach claims the headset has a ten-hour battery life, and we've found that to be true in the field. Turtle Beach's flagship wireless media headset model, the Ear Force i60, delivers the goods in terms of sound quality, surround mix and EQ malleability. Coupled with its functionality with mobile devices, superhuman charge time and overall build, it goes some way to justifying its massive price tag. Sadly, it's a few minimalist design choices away from striking the chord it strives for in the ears of the audiophile Apple user, and at this price in the market there's little room for forgiveness.